The Avenger 25' shares the same name and 14" difference in length overall than the Avenger 24. Both Avengers can be personalized to your liking. But that is where the similarity stops as the larger version adds almost a full foot of beam which gives the boat more walk around space and also improves an already elegantly smooth ride. The Avenger 25 is an entirely different hull which includes 6 lockers and moves the bait well to the transom giving you more aft cockpit fishing area. The ample storage allows for a wide open boat without clutter giving way to serious fishing capabilities on all types of water, all types of weather, seeking all types of fish. There is only one boat does it all. Welcome to the Avenger family. 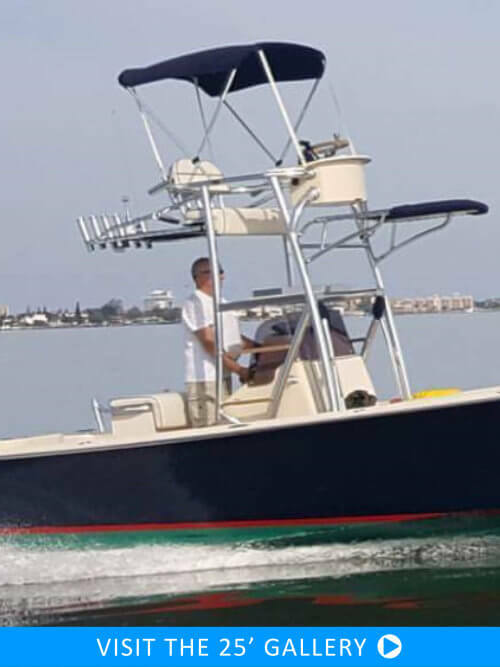 100% Hand-Laid Hull, Custom Rod Racks, 50 Gallon Aft Live Well with High Speed Pick Up and Recirculation, Hydraulic Steering, Hydraulic Jackplate, Self-Bailing Cockpit, Deluxe Console with Front & Rear Access Hatches, and Storage Locker. » Please fill out our Contact Form to get more information about our custom Marauder Marine Avenger Bay Boats.